The Cool-It Caddy is a travel-sized pouch with hidden freezer packs lining the sides. Use it as an insulated makeup bag. 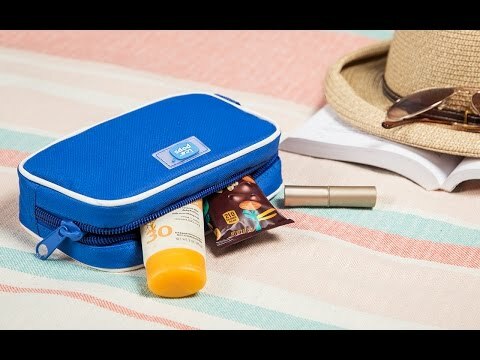 Or a lightweight, mini cooler for snacks or sunscreen. Or to keep heat-sensitive medications chilled on hot days. Just freeze it beforehand, then fill it up when you’re ready to head out. Dimensions: 10" x 7" x 3.5"
Being out and about in the heat makes carrying certain things tough. You might wish you had an insulated makeup bag. Or a mini cooler for small snacks. Or a lightweight way to keep temperature-sensitive medicine cool. The Cool-It Caddy is all of those things—a travel-sized, insulated pouch with hidden freezer packs lining the sides. Maker Deborah Vinci is an avid golfer and outdoor enthusiast who had trouble keeping necessities safe in the Arizona heat. So she created a simple solution. Place the Cool-It Caddy in the freezer with a towel inside to keep it open, then fill it up when you’re ready to head out. Take along makeup, sunscreen, a chocolate-covered protein bar, or even heat-sensitive medication (but be sure to monitor the temperature as needed). The contents can stay cool for up to five hours (it's best to keep your caddy out of direct sunlight, especially on really hot days). With water-resistant fabric, too, splashes from the pool or beach aren’t a problem. Hit the heat and let your everyday items chill.